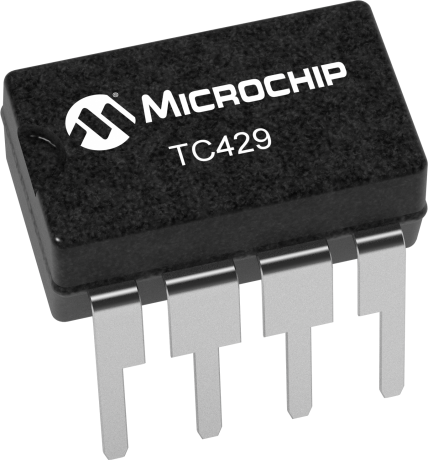 The TC429 is a high-speed, single output, CMOS-level translator and driver. Designed specifically to drive highly capacitive power MOSFET gates, the TC429 features 2.5 Ω output impedance and 6 A peak output current drive. This device can typically switch a 2500 pF capacitive load iun 25 nsec, with a typical delay time through the device of 60 nsec. Rapidly switching the load will minimize MOSFET transition power loss. The device will accept TTL and CMOS input logic voltages, or any voltage input up to 18V without damage, producing an output signal which will swing within 25 mV of the power rails. Logic input current is under 10 µA, making direct interface to CMOS/bipolar switch-mode power supply controllers easy, input "speed-up" capacitors are not required, and the CMOS design minimizes quiescent power supply current requirements. For noninverting applications, or applications requiring latch-up protection, see the MCP1406/7 data sheet.